ON our way to the Whitsundays, mes cheris, Flaneur (fatigued at the thought of the boating and fishing ahead of us) persuaded his companions to head further north from Shute Harbour for a quick tour of Bowen. Surrounded by pristine beaches and bays, this quiet town provides easy access to the Great Barrier Reef (which may viewed by simply wading out at low tide) and is only a 45-minute drive from Airlie Beach. Culture rather than the Coral Sea was our main objective in Bowen, however, and we were très amusé by a big sign painted on the town's water tank, welcoming us to BOWENWOOD as we drove in. Not-so-well-known Bowen was excités, it's safe to say, to be chosen as the location for Baz Luhrmann's $100 million shoot of the Australia epic four years ago. We began with a private tour of the Summergarden Theatre, used as Luhrmann's cutting room during the filming. The small 1940s Art Deco style cinema has classic 1960s Italian projectors converted to the latest Dolby and digital gizmology upstairs. Downstairs there is a homey and eclectic collection of memorabilia in its foyer (an old projector, shell and travel souvenirs and a Rolf Harris painting) and posters signed by Australia stars Nicole Kidman and Hugh Jackman in its corridors. 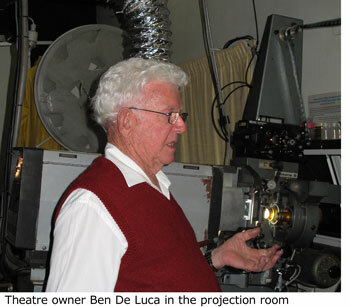 Affable theatre owner and Bowen cinema pioneer Ben De Luca says the theatre was used to view the day's raw film footage ("rushes") before it was sent on to labs in Sydney for processing. "There was no sound, just the picture, which the film crew and editing staff wanted to view and check for discrepancies which shouldn't be there," he said. Mr De Luca, who has been running the theatre since the 1960s, was delighted to be a part of Hollywood history. "It was the culmination of my career," he says, adding that Ms Kidman and Jackman were charming and friendly visitors to the cinema. From the Summergarden, we drove, in an instant it seemed (there are no traffic lights and indeed not much traffic either in Bowen) past raffish old pubs to the town's equally picturesque harbour and jetty which doubled for Darwin in the film. 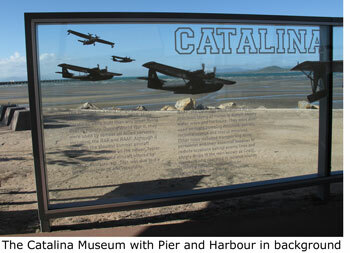 At the harbour we encountered some real rather than Hollwood ersatz history, in the form of Bowen's story as a base for RAAF flying boats (Catalinas, Martin Mariners, Seagulls and others) during the Second World War. The base included a Flying Boat Maintenance Unit, whose key task was to attend to damaged flying boats limping back into the harbour which were repaired and made airworthy again. A substantial concrete slipway into the harbour was laid down for the flying boats and is still there today. 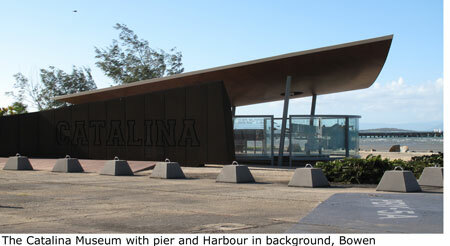 There is also a contemporary monument marking the site and telling the facts of the wartime Catalina base. From 1942 to 1945, the Cats from Bowen made their long milk run patrols far out over Japanese-controlled waters. Some figured in dramatic sea rescues, landing close to airmen who had been forced to "ditch" in the open sea close to enemy positions. The Catalina was renowned as a safe and reliable aircraft with a sturdy hull and dependable motors, but seaplane bases could be dangerous at times. Bowen, with a strong south-easterly wind, experiences frightening swells, making flying boat take-offs and landings hazardous for the pilots. On 17 August 1943, a Catalina took off from Bowen at 1545 hrs on an air to sea gunnery training exercise flight. At the conclusion of firing practice, the aircraft was making a run over the wave tops of a choppy sea and crashed into the sea approximately 5 miles ast of Bowen. Fourteen crew and medical personnel (along for a joy flight) were killed and two crew members were rescued. After the war, a Qantas flying boat service on an Australia-Singapore-England route continued at Bowen ─ the last Hythe flying boat left Bowen on 7 February 1949, ending the town's unique status as Queensland's only international water airport. 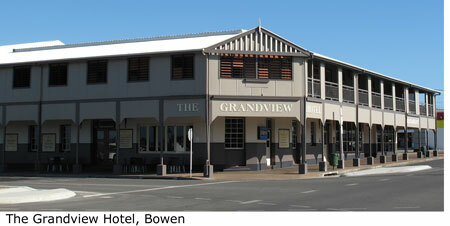 As one of Queensland's oldest towns (founded on 12 April 1861), Bowen has a colourful past, which can be savoured vicariously with a drink at one of its old watering holes (such as the North Australia Hotel) or by sauntering through its historical museum. For more information: www.whitsunday.qld.gov.au/web/guest/history-of-bowen.